This week I spent some time researching elementary schools for you. I know you are just starting at your current school, but you know I'm a planner and I like to do my homework. It was ultimately an exercise in futility, but a happy one. I realized I just couldn't know how much you will grow and where you will be in two years. You could be anywhere, doing anything! Today in the hallway at your school, someone I didn't know stopped me to tell me how smart you are. "You know," she began, while I wondered who she was and how she knew you, "she's bright and engaged and cognitively right where she's supposed to be," she said. "I can tell. She just needs a little help is all." I beamed. Because really, who doesn't need a little help? Reading about schools, I tried to imagine you at five or six. I pictured you in elementary school, learning to read. Doing math. Studying history. Making shoebox dioramas. Walking. Baking cookies with your sister and me. Whatever kids do. Someday, you will do all those things, and more. I know it. Two years ago Daddy and I were just learning about your neurology. We were scared and sad and we just didn't know what it was all going to mean for you and for us. But you were unfazed. You did what no one thought you could do: everything. You rolled over. You sat up. You huffed and you puffed and you pulled yourself to a stand. You said Mama. Dada. Bee. 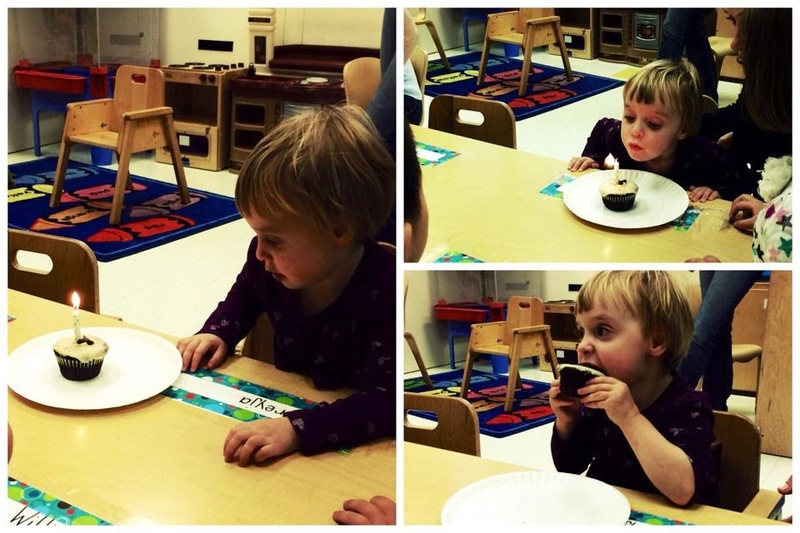 And now, on your third birthday, you're in school. People ask you how old you are and you shout "three!" You count, you sing the ABCs. You like to do everything yourself. "I do it!" you say a thousand times a day. You climb all over everything, trying your best to walk. One day, you will. You speak in sentences and you always say please and thank you. You ask questions that start with what and why. You laugh with us, chiding "be nice!" when we run out of patience or get silly. You're constantly announcing "have to pee!" and every time, we all stop what we're doing and hurry you to the potty. Some of the time you don't even have to go. You just like to sit there with us and have us read potty books to you. You smile wide and hand me Time to Pee or Everyone Poops and I know I've been had. But you're having fun! Nowadays, your language expresses more than just wants and needs. We hear you interject "oh wow!" and "awww, silly Mama!" and "oh no!" into conversations and we know that you're listening and we know that you get it. Daddy and I stayed up late last night, baking cookies and cupcakes for your school birthday party, talking about how magical you are. You are our guide, our teacher, our shining star. Your daddy always says that you might look like him but you have my determination. I am not sure that's true. Yes, I'm a hard worker and I have tenacity. Just like you. Yes, I get things done. Just like you. He may never tell you this, but your daddy is a tough cookie too. He is a survivor. He's been through more adversity than most people and he has somehow found the will to turn his challenges into opportunities. Opportunities to learn, to change, to live his life to the fullest. He keeps going and keeps growing. Just like you. So it's in your blood; it's your nature to fight. But you have a spirit that is unique. You're a fighter, yes, but you don't flail. You just do. Sometimes your life is hard. Sometimes it's really, really hard. But this is the only life you know. You are just you -- and you love being you. Today you are so in love with life. From the moment you wake up until the moment you conk out at night, your life is full and wondrous. Your eyes widen and you gasp with excitement a hundred times a day. You worship your big sister. You love cupcakes. The potty. Your My Little Pony collection. Queen Elsa. Singing and dancing. Books. Hugs and kisses and nibbles. Mama. The school bus, which you look forward to with an impatience I just don't understand. You love school, the park, the pool at the Y, taking baths, even pushing your wheelchair. You just started adaptive ballet and you can't get enough of your fancy tutu and ballet shoes. You are beloved by so many. Never in my life did I think we would have such a well-attended birthday party for a three-year-old. People came in hordes: your first teacher, your old school's director, your past therapists, your family, your friends, and a lot of people who just love you to pieces. No one could get enough of you and you loved being passed from one person to the next, soaking up the attention. You haven't even been at school for a month, and everyone knows your name. "Oh, you're Teeny's mom?" someone will exclaim without me even opening my mouth. "She's the cutest thing ever!" they will gush, and share some sweet anecdote about you pushing the elevator button every morning or getting people's names right by the third day of school or getting an ice pack after bumping your head and announcing that you're all better. "She's already the mayor of the school," someone else pronounced, in the second week of September when you'd been there just over a week. People adore you. Simply put, you sparkle. This week someone explained to me that there is a correlation between the cultivation of gratitude and the ability to problem solve. Apparently both concepts live in the same area of the brain. Until you came, I lived my life feeling very entitled and angry. I deserved this, I was owed that. I worked hard for things and felt robbed when I didn't get them. It never occurred to me that I might already have everything I needed and more. Right around the time that you came, I started to understand how fortunate I was. I am married to the love of my life! I am the mother of two incredible children! I have the best job in the world! I have so many wonderful people in my life! And slowly, the anger and resentment began to fade and it was replaced with a willingness to share my feelings, ask for help and embrace the abundance of love and support that began to come our way. And I realized there was a lot I could do to help get you what you needed, so as I have written about time and time again, I got busy. Maybe I will always be sad that you were not given the same chance that your sister got. Maybe I will never understand why or how it happened. Maybe I will always be tired, maybe the list of calls to make, appointments to schedule, and bills to pay will never end. But I'm not sure any of that matters anymore. I am so proud to be your mama. I can't think of anywhere else I would rather be in the world than right beside you. I am so grateful for you -- you, exactly the way you are. And we have so much time. There is no rush. You will get there when you get there and you are living every moment in the fullest color. You are like Milo of The Phantom Tollbooth, my favorite character in my favorite book. His adventure began with a gift and a note: FOR MILO, WHO HAS PLENTY OF TIME. As he went on his quest to rescue the princesses of Sweet Rhyme and Pure Reason, everyone he met along the way said there was one very important thing about it that they couldn't tell him until he got back. When he finally returned safely, there was a huge celebration in all the land. The kings quietly reminded him of what they'd said at the very beginning. "Yes indeed," they repeated together; "but if we'd told you then, you might not have gone--and, as you've discovered, so many things are possible just as long as you don't know they're impossible." So, happy third birthday to you, my beautiful daughter, my love, my light, my inspiration. May you have plenty of time. And may your life be full of possible. That was beautiful! I'm sure you (and we all) will be amazed at all the things Teeny does in her life. I'm come to believe that the belief that life should be fair is the greatest cause of unhappiness in the world. It makes so many people stuck. I glad you've broken free of that way of thinking. It sounds like your life has become so much richer.